Median lines can sometimes be very useful in mapping out market structure and in identifying potential profit targets. One argument against them, however, is that they are subjective and that as a result no trading strategy that incorporates them can be backtested. Greg Fisher of www.Median-Line-Study.com addressed this problem in a paper he wrote for an MBA independent study course and subsequently published in 2009 as Using Median Lines as a Trading Tool: An Empirical Study--Grain Markets 1990-2005. He also wrote a companion piece, Finding High Probability Lines. Both are brief works (70-some pages) and in part cover material available elsewhere. But his study of the grain markets is a serious attempt at backtesting median line principles. The thorniest problem is the choice of pivot points. They are obvious in hindsight and somewhere between tough and impossible to identify in real time. Fisher uses Andrews’ definition of a trendline: “For an uptrend within the period of consideration, draw a line from the lowest low, up and to the highest minor low point preceding the highest high. The line must not pass through prices in between the two low points. Extend the line.” A pivot is “a reverse in price direction that reverses the previous trend by violating the previous trendline.” (pp. 13-14) Once a pivot forms, a median line and its parallels are drawn. Fisher offers a flowchart of possible price action, starting with the most basic either/or: does price reach the median line or not? 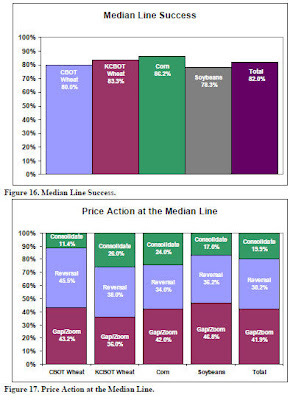 And, among other things, he records the percentage of time price reached the median line as well as price action at the median line. Fisher’s work is thorough and probably about as good as backtesting median lines can be. Yet, as he himself admits, it benefited from hindsight since he was working with historical data. “The study assumes all pivots were chosen correctly as it is based on known price data.” (p. 38) In real time trendlines are drawn and re-drawn. In fact, even in the figure Fisher provides to illustrate Andrews’ notion of trendlines there are obvious places to draw trendlines that misidentify the important pivot points. This is no reason to reject median lines out of hand. Andrews’ method can be used in multiple ways, for multiple purposes. For instance, one doesn’t always have to rely on the most recent, still tentative pivot to draw median lines. Often the best sets are those that the market has already respected. For readers who are unfamiliar with median lines Fisher’s books provide a good introduction. For those who want to subject the median line method to some Monday-morning backtesting Fisher offers a carefully thought out model. ETFs have been a major force in the markets for some years. It is perhaps a tribute to their success that a subcommittee of the Senate Banking Committee held a special hearing last month examining such topics as whether ETFs are contributing to volatility and posing risks to the financial system. Scott Paul Frush writes for those who want, as the subtitle of every “All About” book reads, “the easy way to get started” in ETFs. All About Exchange-Traded Funds (McGraw-Hill, 2012) is a comprehensive introduction. Among other things it includes a brief history of ETFs, it identifies the players, it explains how ETFs come to market, it describes their internal workings, and in a hundred-page section it outlines the main types of ETFs (broad-based, sector and industry, fixed-income, global, real asset, and specialty). It even includes a list of ETF closures by year, through 2010. Third, ETFs are fully invested by nature—“and that’s a very good thing for investors.” Mutual funds, by contrast, must allocate part of their holdings to cash to satisfy shareholder liquidations. “If you were to build a portfolio of 60 percent equities and 40 percent fixed income and later discovered that many of your equity mutual funds hold 10 percent cash, you might not be too happy since that means that your actual portfolio allocation is closer to 54/46 percent equities to fixed income, respectively.” (pp. 46-47) Speaking of asset allocation, Frush devotes a chapter to the topic in the final part of the book on how to use ETFs. All About Exchange-Traded Funds is a well-written, balanced introduction. Both individual investors and financial advisers could profit from reading it. Leonard Zacks, the founder of Zacks Investment Research, has edited a book that should appeal to serious investors who are trying to find an edge. The contributors to The Handbook of Equity Market Anomalies: Translating Market Inefficiencies into Effective Investment Strategies (Wiley, 2011) are mostly academics. They review literature from the past twenty years on market anomalies and draw practical implications for the individual investor. The authors explore strategies that worked, that still work, and—the toughest hurdle of all—that continue to produce excess risk-adjusted returns after all those pesky transaction costs are deducted. Many of the anomalies can be attributed to psychological factors. To take perhaps the simplest case, sunshine has been linked to tipping and the lack of sunshine to depression and suicide. When the sun shines people feel good, are more optimistic, and “may be more inclined to buy stocks thus leading to higher stock prices.” (p. 255) Indeed, studies show, sunshine is strongly positively correlated with daily stock returns, especially the farther one is from the equator. Other weather conditions such as rain and snow are unrelated to returns. Zacks suggests that research on these anomalies be used to create quant multifactor equity models. The investor can embrace that suggestion if she has some quant skills, can subscribe to a scanning service (Zacks Investment Research, of course, provides such a service), or can use select anomalies to supplement her current investing strategy. No matter what the choice, this book is a cornucopia of carefully researched investing ideas. Most people asked to describe the difference between value and growth investing would stumble because these strategies are neither mutually exclusive nor collectively exhaustive. In fact, Warren Buffett argues that “growth is always a component in the calculation of value” and “the very term ‘value investing’ is redundant. What is ‘investing’ if not the act of seeking value at least sufficient to justify the amount paid?” Frederick K. Martin gives full form to this “joined at the hip” reality in Benjamin Graham and the Power of Growth Stocks: Lost Growth Strategies from the Father of Value Investing (McGraw-Hill, 2012). Graham defined a growth stock as “one which has done better than average over a number of years and is expected to do so in the future.” In the 1962 edition of Security Analysis he devoted an entire chapter to analyzing and valuing growth stocks. “Brilliant in its common sense and simplicity, it was a landmark chapter in Graham’s illustrious career before it inexplicably disappeared from future editions of the book.” (p. 65) Martin reprints the “lost” chapter in this book—an important service in and of itself. Martin expands on Graham’s growth ideas in seven chapters. Among the key principles is Graham’s valuation equation: value = current “normal” earnings x (8.5 plus 2G), where G is the average annual growth rate expected for the next 7 to 10 years. Martin also explains how to build a margin of safety for growth stocks and describes the characteristics of a great growth company. He hammers home the power of compounding and invokes Graham’s notion of “Mr. Market” to explain inefficiency in the market. And he gets down in the trenches, showing how to put Graham’s principles into action. Mitch Zacks, senior portfolio manager at Zacks Investment Management and “the firm’s primary expert on quantitative investing,” is the latest contributor to Wiley’s “little book big profits” series. 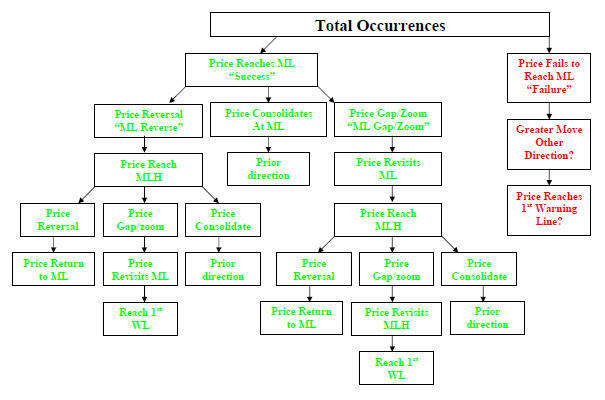 Not surprisingly The Little Book of Stock Market Profits: The Best Strategies of All Time Made Even Better (2012) describes some of the strategies that are inextricably linked with the Zacks name. The author also draws on academic findings summarized in Leonard Zacks’s Handbook of Equity Market Anomalies (to be reviewed on this blog in the very near future). In eleven chapters the author discusses such topics as changes in sell-side analyst recommendations, smaller cap stocks, earnings estimate revisions, price momentum, piggybacking on the trades of insiders, net stock issuance (IPOs, stock buy-backs), quality of earnings, valuation metrics, post-earnings announcement drift, seasonal timing, and multi-factor models. Despite the brevity of the book Zacks is careful to explain the conditions under which the strategies work, what can derail them, and whether they are effective as stand-alones. Let’s take a single example: price momentum. “The data show two patterns that seem relatively stable, or about as stable as financial data ever become. These two patterns are short-term momentum and long-term reversals. In the short-to-medium term, roughly about a calendar quarter or two, stocks that have gone up in price substantially tend to continue to trend upward. However, over the long term, stocks that performed extraordinarily well over the last few years tend to become losers over the next three to five years.” (pp. 64-65) Even though momentum-based trading was profitable until 2000, the normal relationship between short-term momentum and long-term reversals then broke down, and it was not until 2005 that it was re-established. The Little Book of Stock Market Profits can be used as something of a crib or pony by those who don’t want to spend countless hours reading the academic literature. It’s a fast read and offers useful advice for the active investor. For those of us without a Bloomberg terminal New Frontiers in Technical Analysis: Effective Tools and Strategies for Trading and Investing by Paul Ciana (Bloomberg/Wiley, 2011) is an idea book, not a plug and play manual. But even though some of the software tools described in Ciana’s book are not available on run-of-the-mill trading platforms (and where they are, they are available by subscription only) clever programmers may get inspired. Moreover, even without access to proprietary software the imaginative reader can add some new arrows to his quiver. The six chapters in this book are written by six different authors: “Evidence of the Most Popular Technical Indicators” (Paul Ciana), “Everything Is Relative Strength Is Everything” (Julius de Kempenaer), “Applying Seasonality and Erlanger Studies” (Philip B. Erlanger), “Kase StatWare and Studies” (Cynthia A. Kase), “Rules-Based Trading and Market Analysis Using Simplified Market Profile” (Andrew Kezeli), and “Advanced Trading Methods” (Rick Knox). Ciana provides some fascinating data about the preferences of those who use the Bloomberg Professional Service. For instance, Europe opts for log charts 47% of the time and Asia only 9% of the time. Asia prefers candlestick charts, the Americas bar charts. Worldwide the most popular technical indicators (excluding moving averages) are RSI, MACD, Bollinger bands (BOLL), stochastics (STO), directional movement index (DMI), Ichimoku (GOC), and volume at time (VAT). RSI is the clear winner, with a 44.4% worldwide preference; MACD comes in second at 22%. Some indicators have geographical ties. GOC has a 10.8% popularity rating in Asia as opposed to 2.5% in the Americas and 2.8% in Europe. VAT has a 5.3% rating in the Americas and only 1.8% in Europe and 1.6% in Asia. The authors describe the proprietary technical indicators they have developed and give ample illustrations of them. Some of the indicators have been around for quite a while. For instance, there are Kase’s DevStops, which I always mean to study more carefully and somehow never do. And, of course, Market Profile is a well-known if not so well understood trading framework (hence the simplification proposed in this book). For those traders always in search of the next best thing (and all traders should be open minded enough to recognize that regimes change and strategies must be adaptable) Ciana’s New Frontiers in Technical Analysis offers a lot of eye candy. Possibly addictive, perhaps not truly nutritious, but definitely fun to devour. Someday, I trust, markets will get a break from the relentless macroeconomic and political vicissitudes and investors will be able to focus once again on company and portfolio basics. In anticipation of that day Frank J. Fabozzi and Harry M. Markowitz have edited a very useful volume dealing with quantitative approaches to Equity Valuation and Portfolio Management (Wiley, 2011). 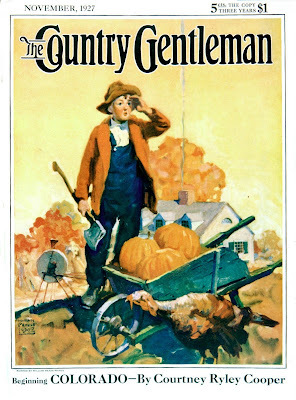 I can’t possibly do justice to the book in this brief post. Let me simply share a single idea that I found promising (and that can be sketched out in a couple of paragraphs). The alpha repair strategy provides a framework for discarding a factor that seems to have lost efficacy and embracing one that seems to have become important. The procedure (which is of course a lot more complicated in its execution than in its bare outlines) has a targeted 100% annual turnover. It has outperformed the benchmark Russell 1000 in a consistently linear fashion—by more than 4% in the period January-August 2010, annually for the past five years, and annually for the past ten years. I can’t quite fathom how I missed the first three editions of this book, but James P. O’Shaughnessy’s best-selling What Works on Wall Street: The Classic Guide to the Best-Performing Investment Strategies of All Time (McGraw-Hill, 2012) is now in its fourth edition. It has been updated with new data covering the recent market turmoil, innovative strategies for investing success, and new material on sector analysis. One of the advantages of buying a book that has a large readership is that it is inexpensive—under $25 on Amazon for almost 700 oversized pages. Backtesting investment strategies is an enterprise fraught with danger, and critics are only too ready to line up to shoot holes in the tester’s methodology, sample size or timeframe, or to decry the value of statistics in general. I, by contrast, am grateful that anyone undertakes a task for which I am ill equipped. For those who believe that history provides a guide to the future O’Shaughnessy’s massive work is an invaluable reference. O’Shaughnessy analyzes all the popular metrics—among them, market cap, P/E ratios, EBITDA to enterprise value, price-to-cash flow ratios, price-to-sales ratios, price-to-book value ratios, dividend yields, buyback yield, shareholder yield, and accounting ratios. He looks at one-year earnings per share percentage changes, profit margins, return on equity, and relative price strength. He dissects the market leaders universe and the small stocks universe and describes the ratios that add the most value in each case. And he looks at how the factors he has examined perform on the sector level. What Works on Wall Street is not a book you read straight through unless you are a possessed numbers wonk. Rather, it’s one you pick at—and the pickings are by no means slim—and put in a prominent place on your reference shelf. Allan M. Malz, currently a senior analytical advisor in the Markets Group at the Federal Reserve Bank of New York and a faculty member at Columbia University and earlier a trader and risk manager, has written a thorough account of the principles of risk management and the challenges facing risk managers today. Financial Risk Management: Models, History, and Institutions (Wiley, 2011) is a big book, over 700 pages. And for those who are not steeped in the basic math of risk management it is a difficult book. The fault, I am the first to admit, lies with the reviewer, not the author. I have a knack for getting in over my head when it comes to quant books. Despite my obvious handicap, I learned a lot from this wide-ranging book. Start with macro/central bank issues such as the structure of the banking industry, stress tests, and financial regulation--especially in the wake of the most recent financial crisis. And since, lest we myopically forget, the world has experienced many financial crises, Malz devotes a chapter to the topic, analyzing such issues as panics, runs, and crashes; the causes of financial crises; and the behavior of asset prices during crises. For those who are charged with managing portfolio risk Malz takes them through the ins and outs of VaR. Especially intriguing to me, albeit mentally tasking, was the chapter on nonlinear risks and the treatment of bonds and options. And, although I would like to believe it’s Monday morning quarterbacking but I know it’s not, we can read about credit and counterparty risk and structured credit risk. Malz’s Financial Risk Management will never be a best seller. But those who need to know how to manage risk—and I would hope that their numbers are not limited to risk managers themselves--would do well to add this book to their must-read list. Richard L. Weissman, the author of Mechanical Trading Systems (2004), has a new book out: Trade Like a Casino: Find Your Edge, Manage Risk, and Win Like the House (Wiley, 2011). It’s a well-balanced book that incorporates trading ideas, risk management, and trader psychology and that is appropriate for both beginning and intermediate traders. Weissman contends that “the single most important tool in developing positive expectancy trading models is the cyclical nature of volatility.” (p. 73) Trendless, low-volatility environments resolve themselves into trending markets; trending, high-volatility markets cycle to low volatility. He discusses the leading volatility indicators, with Bollinger bands being his favorite, average true range following, and ADX rounding out the list. He offers coding for long and short entries and exits using these indicators. Another tool he finds valuable is timeframe divergence, where the shortest timeframe diverges from longer ones. He discusses this tool at some length and provides ample chart illustrations. The book proceeds at an easy gait despite the fact that Weissman recognizes that there are no simple, one-dimensional paths to successful trading. “All market behavior is multifaceted, uncertain, and ever changing.” (p. 191)The master trader, he writes, must be disciplined yet flexible, must reprogram himself to avoid the irrational cycles of euphoria and fear (taking partial profits helps in this endeavor) and instead be even-minded, and must learn to participate rather than anticipate. And, of course, must always practice good risk management. Well, that doesn’t sound too hard, does it? It shouldn’t take all that much work to follow Weissman’s directives. Then comes the chapter on analyzing performance—in particular, the due diligence questionnaire that he advises each reader to complete. The questionnaire with explanations is a staggering 19 pages long and forces the trader to assess virtually every aspect of his business. Anyone who takes this questionnaire seriously should begin to understand how much work really is involved in setting up and running a successful trading operation. Weissman also offers tips on monitoring performance. Trade Like a Casino won’t guarantee the reader a profitable trading career, but it provides a pretty complete outline of what it takes to win like the house. Before I return Mehrling’s biography of Fischer Black to the public library I thought I’d touch on another theme. Herewith some lengthy quotations that may inspire you to find your own style. Fischer spent the early 1970s at the University of Chicago’s Graduate School of Business “safe inside his office on the third floor of Rosenwald, with Myron Scholes on one side and Eugene Fama on the other.” There he “could be a maverick without bearing the costs that everywhere else are imposed on those who refuse to conform to societal norms. He loved it. “Standard classroom lecturing about matters that Fischer thought had already been resolved was simply a bore, and Fischer was lousy at it. He recalled: ‘I was terrible, judging by the ratings my students gave me. I thought lectures were a waste of time for me and for my students (especially when the material is in a book). I looked for every possible excuse to cancel classes. One thing I did was to fill some classes with reviews of past exams. That worked well, so gradually I started doing more of it. Eventually, I worked out the following system. I recently finished reading the Steve Jobs biography as well as Fischer Black and the Revolutionary Idea of Finance (2005) by Perry Mehrling. Both men had cancer and died young—Jobs at 56, Black at 57. In their short lifetimes both transformed their fields. Those who don’t know the basic outlines of Steve Jobs’s life and his embrace of aesthetic and technological principles in the creation of Apple products have been living under a rock. So I’m not going there. Rather, I want to use Fischer Black’s years at Harvard to illustrate some of the powers of intellectual cross-fertilization. He stayed on at Harvard for graduate school—the sole university to which he applied—but, once there, he took only one physics course and barely passed it. Instead, he became interested in computers, and eventually artificial intelligence, and petitioned “to switch officially from theoretical physics to applied mathematics.” He took a course on B.F. Skinner’s psychology of learning, but failed it. He was more comfortable with the cognitive approach to learning and took two graduate courses in this area. Now in its sixth edition, the 2012 Commodity Trader’s Almanac (Wiley) once again provides a treasure trove of price data and seasonal trading ideas. It belongs on the desk of everyone who trades commodity futures and U.S. dollar crosses as well as stocks, ETFs, and ETNs that are commodity based. First of all, if there’s any place seasonal strategies work it’s in commodities. And the 2012 strategies are no rehash of those of 2007. The almanac switches around the commodities that are analyzed. 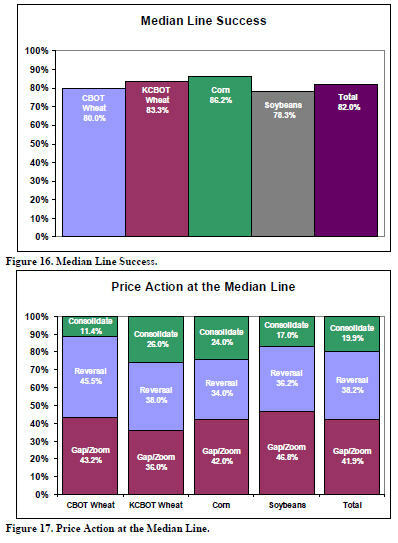 For instance, the commodities that received a one-page analysis in June 2007 were coffee and crude oil whereas in the June section of the 2012 almanac we read about soybeans, sugar, beef, and corn. The almanac follows the familiar Hirsch format. It’s spiral bound, which means it lies flat when open. About 60% of the volume has calendar entries with appropriate quotations on recto pages, analysis on verso pages. Then come contract specifications, a list of select ETFs, a series of potentially profitable trading patterns, and an extensive long-term data bank (annual highs, lows, and closes as well as near-term contract monthly percent changes) for the S&P 500, 30-year Treasury, crude oil, natural gas, copper, gold, silver, corn, soybeans, wheat, cocoa, coffee, sugar, live cattle, lean hogs, British pound, Euro, Swiss franc, and Japanese yen. 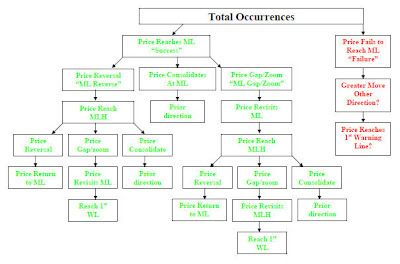 Tim Knight, founder of Prophet Financial Systems (now part of the TD Ameritrade stable) and a well-known blogger (Slope of Hope), takes yet another look at pattern trading in High-Probability Trade Setups: A Chartist’s Guide to Real-Time Trading (Wiley, 2011). The bulk of the book is devoted to nineteen patterns: ascending triangles, ascending wedges, channels, cup with handle, descending triangles, descending wedges, diamonds, Fibonacci fans, Fibonacci retracements, flags, gaps, head and shoulders, inverted head and shoulders, multiple bottoms, multiple tops, pennants, rounded bottoms, rounded tops, and support failure. In each case he defines the pattern, explains the psychology behind it, and provides examples. The two shorter parts of the book provide an overview (a primer on chart setups and the author’s personal trading journey) and tips on setting stops and being a bear as well as a guide to real-life trading. For those who are looking for a solid introduction to pattern trading Knight’s book is first-rate—clear descriptions and lots of ProphetCharts. For those who are old hands at chart patterns the book bears testament to the fact that sometimes profitable patterns really do stare you in the face.